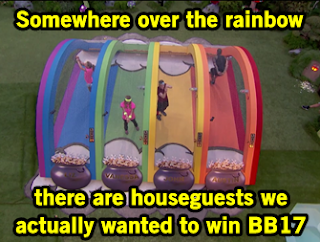 The houseguests continue navigating gold eggs across a chicken wire arch in attempt to win HOH. Everyone is really playing to win to secure their spot in the final four, though winning this HOH also makes this week's ruler really vulnerable going into the final week. This competition is beyond boring to watch, but I'll always enjoy the sound effects of a goofy egg drop and loud crack of the shell. Vanessa narrowly beats Johnny Mac and becomes HOH yet again, and while it guarantees her safety it also means she has to choose between her two alliances. Liz wins the luxury prize which is a day outside the Big Brother house with Frankie Grande. Hard pass, I'd stay locked up in the house. He arrives covered in glitter and jumping around desperate for attention. Liz chooses Vanessa to accompany her on a "grande experience" to see Frankie's super famous sister Ariana Grande perform in concert. Despite having a private suite to watch from, the show doesn't want the houseguests identified so they put on disguises like an episode of Undercover Boss. 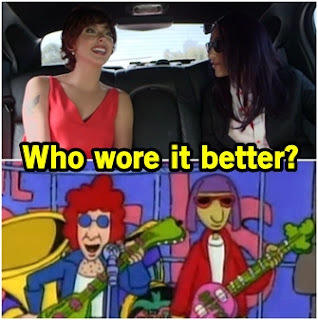 Basically, Vanessa looks like the bass player of The Beets from Doug and Liz looks like she should be a parent on Dance Moms. Both meet Ariana and get swag as a way to just publicize more Ariana BS. The house does not care in the slightest about the recap of the night's events. Everyone feels good about Vanessa winning because everyone has an alliance with her. The question is which side will she move ahead with? Vanessa begins her grand inquisition to compare everyone's stories and deals to find reasons to justify nominating someone. Steve's stories do line up, but he admits to Vanessa that he made a deal with Liz that would save him in a tiebreaker situation if she had won HOH. Liz insists she would've broken the deal and her targets were Steve and John. Then she gets annoyed at Austin for making deals with both Steve and John, but she specifically told John to make the deal. Basically, Vanessa is annoyed that any people dare make deals that don't involve her. Since competition wins are a deciding factor at this point, Vanessa decides to turn on John and make him the target. Vanessa doesn't believe a final three with Steve and John will happen, while Steve points out this totally screws their numbers. Numbers be damned as Vanessa nominates Steve and John for eviction, despite their once solid final three alliance. Vanessa cries in the house after betraying Steve and John yet again and they're over her phoniness. She assures Steve he is safe and that John is her target, which he totally senses and offers to throw the veto to Austin or Liz in order for them to break their deal with Vanessa. They like this idea a lot but of course can't keep ANYTHING secret and tell Vanessa. Why does everyone insist on telling Vanessa their secrets?? It's only during the magnetized puzzle about some upcoming CBS show that John makes the game-time decision to win the veto for himself because you can't trust any of these goons and Steve was almost able to save himself. John saves himself at the veto ceremony so Vanessa does the "fair" thing and nominates Austin since Liz was nominated last week. Vanessa and John collaborate on who to eliminate this week, choosing between Steve or Austin. Vanessa wants to eliminate Austin since Steve will take them to final three, but John is a crazy person who would keep a showmance just to spite Vanessa. 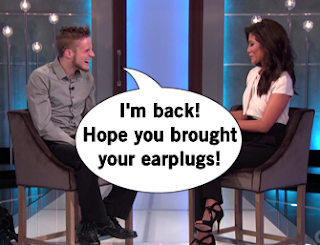 The house is totally shocked on "Tuesday" (Monday in actual time) when Julie Chen summons them all to the living room for a surprise eviction. Steve and Austin deliver their final speeches on the fly and then the vote happens. Liz votes to evict Steve and John votes to evict Austin, which forces HOH Vanessa to break the tie. Vanessa faces the two nominees and two past allies, and stresses that as a game move she had to vote to evict Austin. He's shocked, annoyed, and barefoot. Of course, Vanessa cries. Austin is upset because Vanessa would've gone to the final three regardless and didn't need to "'Judas' Judas." But hey he found love with Liz and fulfilled his entertainment dream, and now my mom can watch the feeds with a little less hatred. 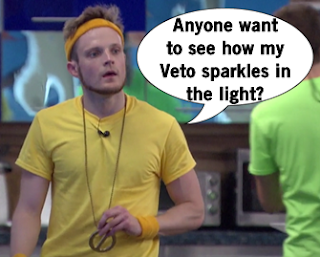 The night ends with Steve winning the Head of Household competition to guess bleeped words said by previous houseguests. HAHA she said "lost" friends but it sounded like "f***" friends! Speaking of F friends, this week will be a huge screw you to someone as their final three dream ends. Steve is the new HOH and knew he would be safe since minutes before the surprise eviction John and Vanessa told him to trust them. Liz is tired of Vanessa's crying and it's like girl, grab one of those teeny deli counter tickets and get in line with the rest of us. But Liz's options for an ally are limited since she can't stand Steve and John so of course, she aligns with Vanessa AGAIN. One final two deal isn't enough for Vanessa, so she makes deals with Liz AND Johnny Mac. Oh she never lies, guys. At least it's nice to see her face on the memory wall as a nominee alongside perennial nominee Johnny Mac. The goal of the Power of Veto competition is don't let Vanessa win, because she would have all the power, immediately go to final three, and slaughter them all in the finals. Each dressed in a karate gi, the houseguests enter the backyard for the Beastmode Cowboy hosted Power of Veto competition. You might think this competition looks familiar because the show literally painted over the boxing number punch from last season and turned it into karate dudes. After everyone reiterates the importance of Vanessa not winning, she wins. This means Vanessa holds all the power this week and will cast the only vote to evict. Vanessa saves herself with the veto, forcing Liz to become the replacement nominee. Vanessa stands in front of the room and casts her sole vote to evict Johnny Mac since he had alliances with others and she couldn't trust him. Says Vanessa, the woman with alliances with everyone. But John admits he totally would've booted Vanessa and probably should have made changes to his game that could've let him win.